Notorious Mexican drug lord Joaquin “El Chapo” Guzman escaped from his high-security cell over the weekend via a mile-long tunnel that took some masterful engineering chops. This was not the kingpin’s first time vanishing through a tunnel—in fact, tunnels are something of a trademark for him. As the head of the Sinaloa Cartel, where he amassed a fortune of more than $1 billion smuggling cocaine, heroin and marijuana, El Chapo pioneered the construction of elaborate tunnels underneath the US/Mexico border to transport drugs. He also made an escape from Mexican authorities when cornered in 2014 through an complex system of tunnels that connected six different houses. His entrance was hidden under a bathtub. A 2001 jailbreak saw El Chapo wheeled out of prison in laundry cart, but the latest escape is jaw-dropping in its audacity, impressive engineering, and the amount of complicit corruption that must have been involved. 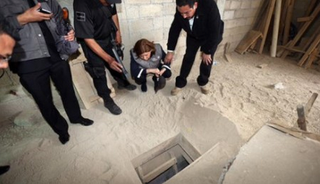 The hatch was in El Chapo’s shower, a 20 inch by 20 inch hole with a ladder that descended 32 feet into the tunnel. The tunnel was 5.6 feet high and about 30 inches wide. It was illuminated, ventilated, and had a motorcycle on a track that El Chapo is thought to have ridden to the outlet, a home under construction more than a mile away. After he went to the bathroom and did not return, guards discovered El Chapo’s disappearance. More than two dozen employees of the prison have been detained for questioning. In the past, El Chapo has flaunted having a regular supply of people at every level of authority on his payroll. His daring escapes and evasions of capture have given him a folklore-like status in Mexico, though the infamous Sinaloa Cartel “has been deeply involved in the violence that has claimed tens of thousands of lives here in recent years,” and he is wanted internationally. US authorities, which had sought to extradite him, must be grinding their teeth, and Mexican President Enrique Peña Nieto’s government has been deeply embarrassed by the escape. “What a shower!” Edgardo Buscaglia, who studies global security issues for the United Nations, quipped on his Twitter account. One thing’s for sure: El Chapo loves tunnels, and he’s got some serious underground masterminds on staff. If he’s caught again, maybe give a little thought to the jailhouse bathroom design?